According to Xun Betan (Venustiano Carranza), the group’s founder and coordinator, the group’s mission is to produce a Tsotsil literature that originates from Tsotsil understandings of the world. That’s why, both in their first anthology and in an upcoming English translation of the group’s work in the North Dakota Quarterly, they label themselves “a poetic experiment in Bats’i K’op (Tsotsil Maya).” Betan noted that, unlike Maya K’iche’ and Yucatec Maya, languages whose pre-Hispanic literary traditions were recorded in the colonial Popol vuh and the Books of the Chilam Balam, respectively, there are no Tsotsil language colonial documents that reflect what we would call a Tsotsil literary tradition. The group sees its work as being more “experimental” and much less proscriptive than the traditional literary workshop setting, as they explore Tsotsil language as a medium for literary expression. For readers already well-versed in US Native American literature, this situation is not unlike the one described by Laguna Pueblo writer Leslie Marmon Silko when she asks, “What changes would Pueblo writers make to English as a language for literature?” with the key difference here being that these writers are undertaking this work in their mother tongue. Group members Suzi Bentzulul (Chicomtantic, San Juan Chamula) and Rolando Vago (Yabteclum, San Pedro Chenalhó) not only underscored the linguistic power relations that make this work necessary, but also the restorative effects of using Tsotsil as a language for poetic composition. 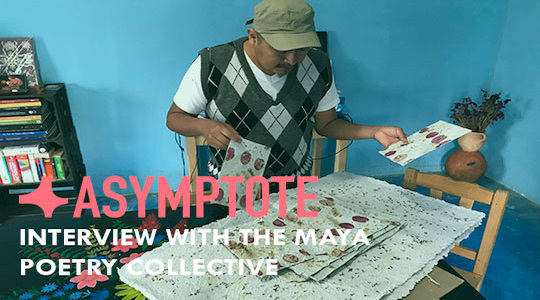 Both grew up in urban San Cristobal de las Casas and, like many young speakers of indigenous languages around the world, suffered discrimination that lead them to question the value of Tsotsil as a language and being Tsotsil as an identity. As university students who were already writing in Spanish and Tsotsil, they decided to attend one of Betan’s early literary workshops when they saw a flyer for it. For them, the workshops fortify Tsotsil language and literature, while privileging a collective process of literary creation that defies notions of authority, authorship, and a literary market that tends toward individual recognition. With that in mind, it’s no surprise that the group pays scant attention to forums for Mexican Indigenous literatures during the last forty years, whether it be prestigious awards like the Premio Nezahualcóyotl or state patronage institutions and programs. Rather, they print, hand bind, and distribute their own work, the first example of which is the eponymous Snichimal vayuchil. Works in progress include an anthology of writing by the group’s female members, and another by its male participants. For group members, this independent orientation has several benefits. First and foremost, it means that the books are the products of many hands in terms of both text (the written poems) and textuality (the physical objects of the books themselves). Further, it allows them complete freedom to publish what they want to publish in the format they want to publish it in. Finally, they become the sole arbiters of when and where they present their work, having done so in spaces as diverse as caves, mountains, open fields, and the steps leading up to the church in San Cristobalito. In a sense one could read these gestures as highly local and radically anti-world literature, and yet by refusing to participate in well-established publication channels, these writers further expose how fraught and utterly complex approaches to Indigenous literatures must be. As authors who self-translate from Tsotsil into Spanish, they are interested in the kinds of broader dialogues that will come from having their work circulate digitally in English. That said, in English or Spanish, in a hand-bound book or online, they insist that those dialogues be on equal footing, and that they be allowed to express themselves, above all else, in Tsotsil and as Tsotsiles. Paul Worley is Asymptote‘s Editor-at-Large for Mexico and a professor of English at Western Carolina University.